Interstate 790 forms an L-shaped route between Downtown Utica and the New York Thruway (I-90) at Exit 31. The east-west leg constitutes separate roadways running adjacent to I-90 from LeLand Avenue (NY 5) west to the NY 8/12 expressway along Horatio Street. A trumpet interchange connects this section of I-790 with the Thruway. It also doubles as NY 5, which dog legs south from Herkimer Road via LeLand Avenue. The north-south branch of Interstate 790 accompanies NY 5-8-12 south from a directional cloverleaf interchange joining Horatio Street with NY 49. NY 49 extends the expressway west from I-790 to Rome while I-790 crosses the Erie Canal and Mohawk River into central Utica. 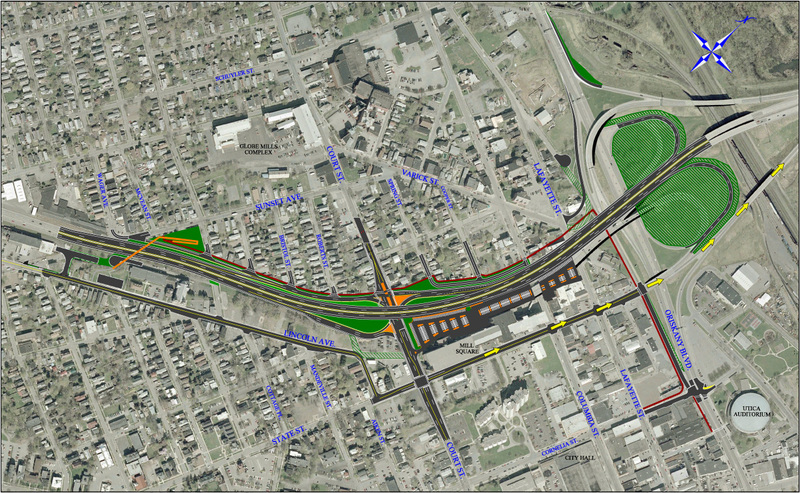 Interstate 790 extends south to the Court Street off-ramp west of Downtown. NY 5-8-12 continue from that exchange along the North South Arterial Highway to New Hartford. An end shield for Interstate 790 precedes the loop ramp for Genesee Street north along the eastbound roadway taking New York 5 to Leland Avenue. Photo taken by Douglas Kerr (04/01). A Breezewood connnection links the New York Thruway with Interstate 790 & New York 5 west via Genesee Street. A trumpet interchange joins the Thruway access road from Exit 31 to Genesee Street south of I-790 and Auert Avenue. Photo taken by Douglas Kerr (08/00). The New York Thruway crosses the Oneida County line 1.6 miles ahead of Exit 31 for Utica. New York 5 (Herkimer Road) and the Erie Canal parallel I-90 leading west to the trumpet interchange with Interstate 790. Photo taken by Douglas Kerr (08/00). The east end of Interstate 790 appears along side the New York Thruway eastbound at Exit 31. Photo taken by Douglas Kerr (05/15/02). New York 5S (Oriskany Street) leaves Downtown Utica and meets I-790 east and NY 5-8-12 (North South Arterial) by Utica Memorial Auditorium. New York 5A takes over along Oriskany Street west to the village of Yorkville. Photo taken by Douglas Kerr (09/16/02). NY 5 east & NY 8-12 north at the directional cloverleaf interchange with NY 5S west and NY 5A (Oriskany Street) east on the former viaduct carrying Interstate 790 north. Replaced by the Utica North South Arterial Project in 2013-17, this elevated roadway dated to 1962. Photo taken by Chris Jordan (07/01). The North South Arterial Project added a new eastbound off-ramp from New York 5A (Oriskany Street) to parallel Lafayette Street where this guide sign for I-790 east was previously located. The North-South Arterial carries NY 5-8-12 south to NY 840 at New Hartford. Photo taken by Douglas Kerr (10/12/02). “Governor Cuomo Announces Completion of $66.5 Million North-South Arterial Project in Utica.” New York State Governor’s Press Office. October 31, 2017. Route 5/8/12 North-South Arterial Viaduct Replacement. NYSDOT project web site. Page updated February 19, 2019.